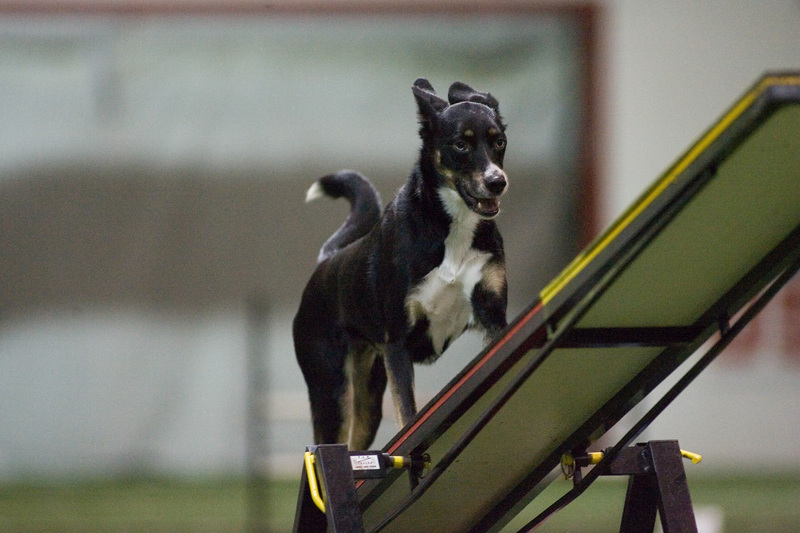 Most of what dogs do in agility are natural behaviors – running, jumping, climbing – but the teeter-totter is not. Take another look at those videos if you’ve never seen a dog on a teeter-totter. The teeter is weighted so that one end stays on the ground. 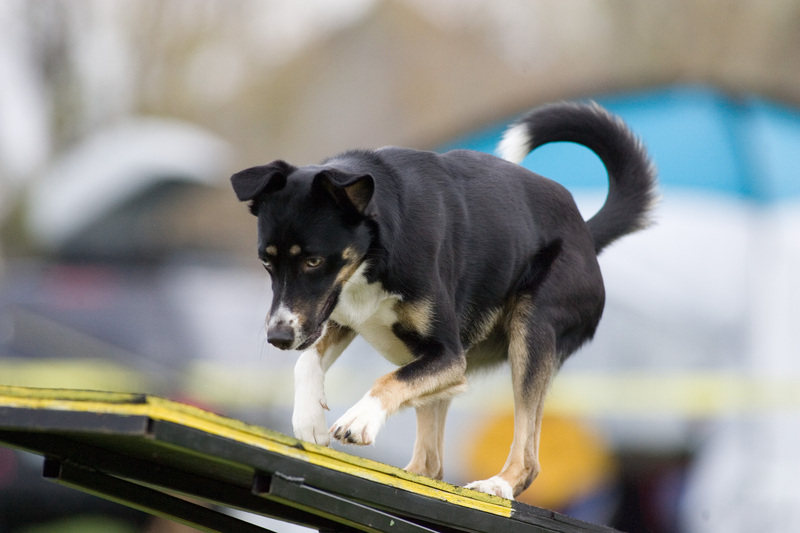 The dog has to run up the board, pause at just the right place where her weight causes the board to tip, and ride the board until the up-end touches the ground. At first, I clicked the clicker and gave Blue a small treat anytime she looked at the teeter-totter, which made the teeter interesting, so Blue started looking for it when we went to class. After several short training sessions, I upped the ante just a little. I continued to click and give Blue a reward anytime she approached the teeter-totter, but stopped giving so many rewards for just looking at the board. When Blue sniffed or touched the teeter with a paw, she got extra treats. Whenever she saw the teeter, Blue’s neurons started firing and her brain released dopamine. She was excited and eager to play because she associated the teeter with getting a reward. For several months, I rewarded Blue for doing things that would ultimately lead to the desired end result of Blue walking the teeter. I never ‘corrected’ her; there was no ‘bad’ behavior, just behaviors that were rewarded and behaviors that were ignored. To illustrate the connection between teaching my dog to walk a teeter-totter and helping you write more consistently and joyfully, consider how enthusiastic and confident a dog would be about approaching a wobbly, tipping board if the training had been negative, demanding, critical and required instant perfection. To motivate yourself as a writer with positive reinforcement, you have to access where you are now and where you want to be. 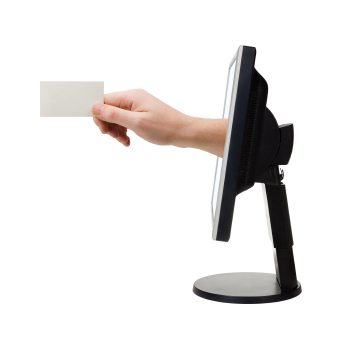 Then you need to determine what intermediate steps will get you to the desired end result and reinforce those behaviors with rewards. I wanted Blue to learn to run up a teeter, find the tipping point, tip the board and ride it safely until it touched the ground, and then run off eager to do the next obstacle. 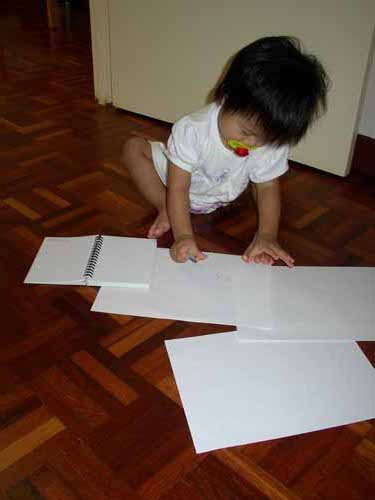 She could do none of those things in the beginning, but she can do all of them now with confidence and speed. My trainer helped me figure out what baby steps along the way to reward: look at the teeter, approach the teeter, sniff it, touch it with her nose, touch it with her paw, put one paw on it, put two paws on it, stand on it with four paws, walk one step on it, walk several steps, walk to where it tips, tip it, walk the whole length of the board, trot the whole thing. It took months, but Blue learned to navigate the teeter-totter like a pro. She did it because it was fun and interesting, not because I demanded it of her. Maybe it’s easier to give a puppy permission to play around and do something that only approximates the end result we’re looking for. You might feel silly giving yourself rewards for doing something simple that only approximates the way you eventually want to write. But the technique will work. And when you finish retraining yourself, you won’t need to reward every little step. In our 4th and final part of our series on Rewarding Yourself, you’ll explore what your “teeter-totter” looks like and what kind of rewards will help you navigate that challenge like a border collie. Thanks Amy! I’m delighted to hear the blog is helping. Keep showing up! I think blogging works this way for me … I write some off the cuff, thing, people respond favorably, and the next time I move a little farther into it, do a little better. Hmmm. Good for you Caro. The best writing always comes from rewriting and anything we can do to encourage and reward ourselves for coming back to the writing is worthwhile.